President Obama is to appear in Boston Wednesday to campaign for Representative Edward J. Markey. He will attend a rally at the Reggie Lewis Track and Athletic Center. 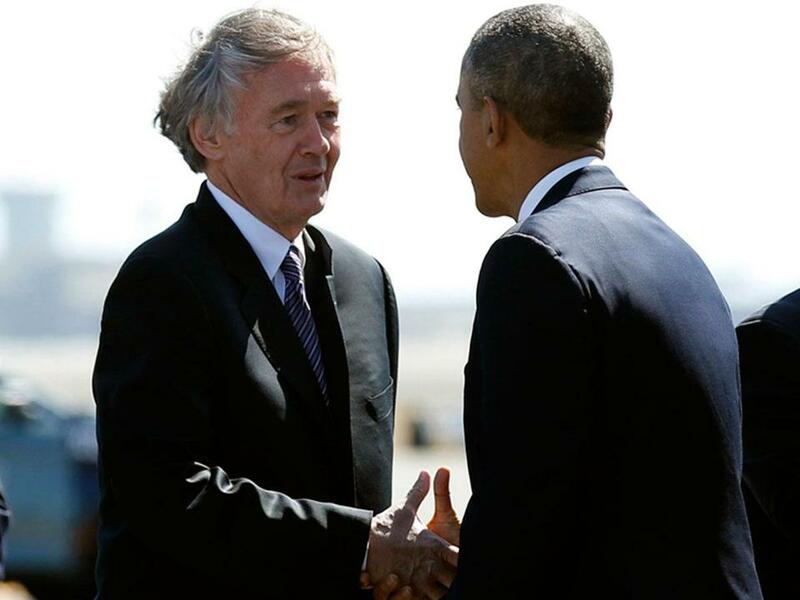 WASHINGTON – President Obama arrives in Boston on Wednesday on the kind of mission for which he is known to excel — headlining a rally for Democrats, in this case Senate candidate Edward J. Markey. But Obama arrives at a difficult moment in his presidency. Much of his agenda has stalled in Congress and even some Democrats from Massachusetts are pounding him on key issues. Seven months after he was reelected by a wide margin, Obama has struggled to convert any mandate he had from voters into broad changes. Gun control, one of his biggest priorities, failed in the Senate and most other legislative initiatives appear stalled. Instead of pushing new policies, he has become more reactive, responding to controversies over the IRS targeting conservative groups, the Justice Department’s aggressive approach to leak investigations, and the leaking of national intelligence surveillance programs. Markey and his Republican rival, Gabriel E. Gomez, have traded barbs about the president's visit, which includes a rally at the Reggie Lewis Track and Athletic Center in Roxbury. Before the rally, Obama will also attend a smaller private event, which a White House official described as “a photo line for donors.” Markey said the event would raise money for his campaign, but his spokeswoman would not say how much. A presidential visit can help a candidate raise money, boost exposure, and motivate campaign workers. But it rarely makes or breaks a campaign; that type of moment would be more likely to come in a candidate debate, such as the one Tuesday night in Springfield. Still, Markey said Obama’s appearance is a plus. Gomez, however, said the president’s appearance showed that Democrats were worried about losing the Senate election. Obama’s visit could revive memories of his trip here more than three years ago when he campaigned for Martha Coakley in the waning days of her unsuccessful Senate bid. It is too early to tell whether the latest Massachusetts special election indicates any broader moment – indeed, Markey leads in recent polls – but Obama’s presidency is in another period of uncertainty. Now, with the national discussion consumed with whether he has threatened civil liberties with his approach to national security, Obama risks alienating some of his most ardent supporters. Representative Michael E. Capuano, a Somerville Democrat, has been increasingly vocal in his criticism of Obama, pointing to the leak investigations and aggressive immigration enforcement. Still, while Democrats are frustrated, their angst is directed mostly on a stuck agenda, not the president himself. A presidential visit can help a candidate, but it rarely makes or breaks a campaign. Representative James P. McGovern, the Worcester Democrat, asked what the president could do to get things back on track, responded, “I think at this point what is key to a successful presidency is keeping a Democratic Senate and trying to win back the House in a year and a half,” McGovern said. While Obama still has better numbers in the Bay State than he does nationally, his approval and favorability ratings in Massachusetts have dropped over the past month, according to a poll released on Monday by Suffolk University. In May, shortly after Obama came to Boston after the Marathon bombings, the president was viewed favorably by 67 percent and unfavorably by 29 percent of respondents; this month, he was viewed favorably by 60 percent and unfavorably by 35 percent. The poll, which had a margin of error of 4.4 percentage points, has Markey leading by 7 points. White House advisers insist they are moving forward. Most meetings begin with what they say is their “North Star,” passing new policies that will help the middle class. “It’s important to view this as a work in progress,” said David Simas, Obama’s deputy senior adviser. Simas ticked off several things that the White House has done while most of the attention has been on scandals: cracking down on those who abuse the US patent system; holding a mental health conference; and starting an expansion of broadband and wireless Internet access to every public school and library. A review of some of Obama’s promises he made four months ago during the State of the Union address finds little progress. Gun control legislation was voted down by the Senate, one of the most stinging defeats. The conflict in Syria has only grown more intractable. Some of the broadest proposals — overhauling the tax code, cutting another $1.5 trillion from the deficit, and doing more to address climate change — appear no closer to reality now than they did then. Several promises are either completed or appear on track, including drawing down troop levels in Afghanistan, reauthorizing the Violence Against Women Act, and establishing a nonpartisan commission to improve voting issues. An immigration bill, one of the major focuses of the administration, is set for debate in the Senate this week. Some of his other proposals — such as $50 billion for a program to repair the nation’s infrastructure and expanding prekindergarten access — were included in Obama’s budget proposal. But that blueprint is unlikely to go anywhere. Obama, meanwhile, went on a “charm offensive,” treating Republicans to dinner and golf outings. While that has yet to translate into legislative accomplishments, Markey says it is too early to draw conclusions.